We've seen the bionic Lego tortoise before, but where as that poor guy lost a limb, this little guy named Blade lost the use of all of his limbs. 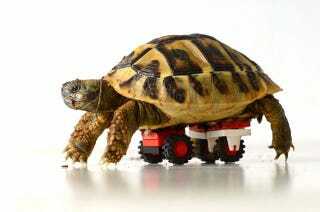 He is now able to scoot about with some Lego wheels that are attached to his underbelly. Thankfully, the wheels are a temporary thing, as Dr. Plishcke expects Blade to recover the full use of his legs. Good thing these wheels detach!